By tour0655 on 30 July 2012 . Built in 1889, the building was home to the Cherokee Bar on the first floor and Seminole Hotel on the second. 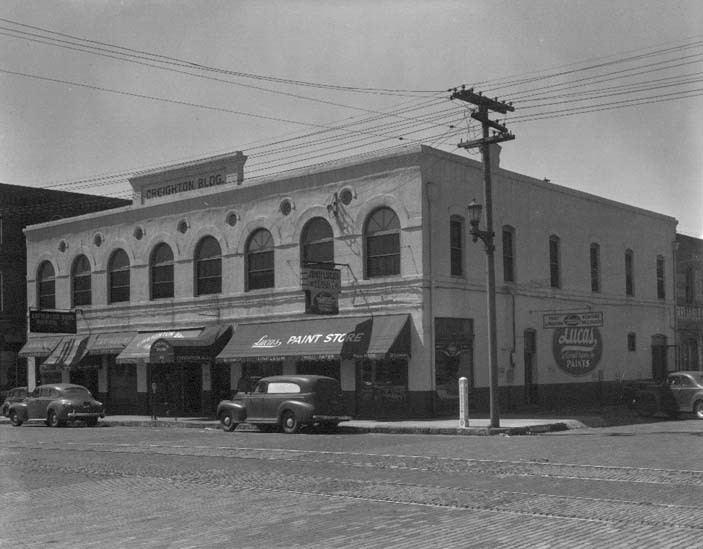 The building was conveniently located to the port, which was just two blocks to the south down Franklin Street. Whiting street was lined with one and two-story brick buildings which extended to the Hillsborough River. Tampa Street, which now intersects Whiting was not built until 1925. The building was renovated in 1910 adding its current facade, and expanding the total building footprint to 70′ x 80′. After the renovation, the first floor was used by a wholesale grocery store and the original second story hotel was converted to offices. The building had many uses throughout the decades. More recently it was occupied by the Longshoreman’s Association on the second floor. They moved out in 1980 when architect John Howey purchased the building and renovated it to the contemporary office spaces that it houses today. In addition to the 101 South Franklin Street Building, the other historic brick buildings on Whiting Street have been remodeled to house an interior design firm, Greiner’s Men’s Clothing and the USAmeribank offices.